A hood covering the Frank Rizzo statue is removed during the Black Lives Matter protest, Friday, Aug. 12, 2016. 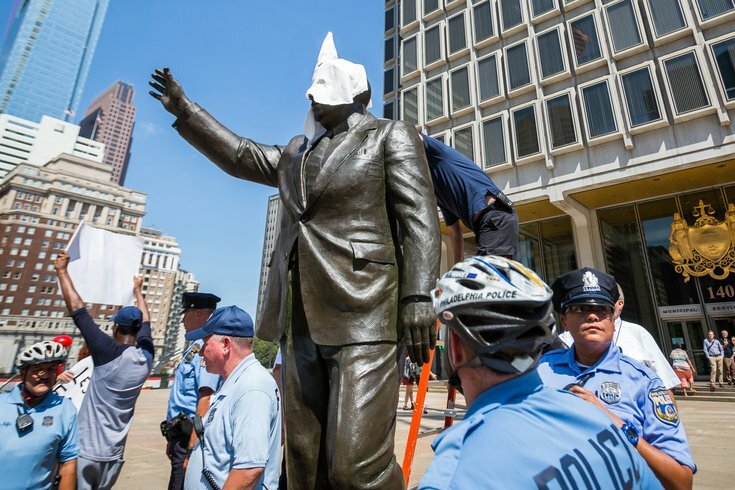 Police arrested a man who allegedly chucked eggs at the Frank Rizzo statue in Center City Wednesday morning, shortly after a violent weekend in Charlottesville over the weekend sparked a Philadelphia councilwoman's call to remove it. 6ABC posted a cellphone video of the 25-year-old man running away from the statue around 10:40 a.m. after the statue was egged. Officers chased the man, who is from Maplewood, New Jersey, and took him into custody, according to the new station. Opponents of the statue point to Rizzo's treatment of activists and the black and gay communities. His tenure in City Hall from 1972 to 1980 followed a distinguished career in the Philadelphia Police Department. The city placed crowd-control barricades around the controversial statue Tuesday night after somebody apparently vandalized it, 6ABC reported. Last August, protesters placed a Ku Klux Klan hood over Rizzo's head and vowed to "tear down" the statue if the city didn't take action. Asa Khalif, a Black Lives Matter Activist, on Tuesday renewed calls to bring the statue down. "Get it off city property. Put it in a museum. Put it at his son’s house," he told PhillyVoice. "Just get it the f*** out of plain view. Replace it with Rocky. I don’t give a f***." That followed the violence over the weekend in Charlottesville, Virginia, where attendees of a white nationalist rally and counter-protesters clashed. Tensions boiled over when a car drove into a group of protestors against the rally, killing a 32-year-old woman and injuring a number of other people. After the rally – organized in protest Charlottesville's plan to remove a statue of the Confederate General Robert E. Lee in a park – Councilwoman Helen Gym called on the city to take down the Rizzo statue. "All around the country, we're fighting to remove the monuments to slavery & racism. Philly, we have work to do. Take the Rizzo statue down," she wrote on Twitter Monday night. Lauren Hitt, a spokeswoman for Mayor Jim Kenney, said this week that the city thinks "now is a good time to have a conversation about the statue's future." Overnight, Baltimore removed two Confederate statues, citing public safety.